Hi Jonas! Thank you for the compliment. I’m glad you enjoyed the movie (and the music). Compliments such as yours inspire me to better my craft. Hope you drop by my blog every now and then. Cheers! I’m a Fil-Am filmmaker in the states and I ran into your blog on a search for a Filipino director and needless to say I was hooked with your achievements instead. Congrats on the latest movie! Awesome score and the band you manage “Candles” definitely fits my bill for well-produced quality music. I’m always on a quest to reconnect with my fellow Filipino filmmakers and would certainly like to stay in touch! Keep up the good work. Keep in touch. I’ll email you soon. Send you my email add via that message. Iwas sa spam eh… hee-hee! So good to hear from other Noypis! Hope you drop by my blog frequently. Ingats! Yeah, would definitely like to stay in touch. And examine the prospect of collaboration…hopefully before long. I’m aiming to do my next project in the Philippines. Looking forward to your e-mail. Congratulations on X44! I have yet to watch it, though, so i can hear your work on it. About 9 years ago, i had a conversation with some friends over kebabs and beer, about what movies we would like to produce if we had the chance to. I told them that i wanted to revive Tony Falcon, Agent X44. I wanted to release it by the year 2000 just so that i could call it “The Millennium Falcon”. Jay… bwehehehe… “millennium falcon”! oo nga ano?! You can check out the theme of Agent X44 (not the “Chickboy” novelty song) on one of my blog entries here. I arranged and performed the main theme as well. Also in one of my blogs entries is the same music but with demo vocals which will be used for the sequels. Check them out when you have time. One of the coolest blog I’ve visited… KEEP IT UP! Thanks for visiting the site, by the way! I’ll go check your blog in a bit. Hope you frequent my site in future! Thanks again! How’s your mom? You got married na ba? So many questions eh… I don’t really get to talk to Jun King that much anymore eh… although I do get to talk to Jaypee every so often. i find this entertaining and informative at the same time. hala! mukhang may reunion ng former child stars dito?! wahehe. Salamat for the link. We’re honored. Sir, I learned that meron palang “book 2” ang Mirada De Mujer [Mirada de Mujer: El regreso]. Sana composition nyo pa rin yung maging theme. Just like ‘Bakit’ by Rachelle Ann Go which is the official theme ng “book 1”. You know… I wasn’t aware na may Book 2 ang Mirada. How’d you find out? If ABS-CBN does air the 2nd book, I’m quite sure they’ll be using the same song. Unless umabot ang next album ni Sarah Geronimo before Mirada’s Book 2 airs cause I have a few songs included in her new album (which I am producing also, by the way). Depende talaga what happens if and when Book 2 comes out. Im just new on this site, just saw it in getitfromboy. I didn’t expect that you have so many achievements now, different from the Chuckie that I see on TV. Nice site ei! Its so updated & informative, that’s why you should be called the BLOG MASTER. Hehehe! Havn’t seen you on TV for quite awhile. I didn’t know that you love music & movie so much. Im not a movie buff but with music, Im truly one. I’ve been singing since elementary days till college. Joining school concerts, singing contests (choral, group & duet where we always get the 1st prize…not solo, still don’t have that much confidence…), being in a college choir. Its like I can’t leave the house without my IPOD or my walkmanphone, loves to sing anywhere, inside the jeep, walking, even in the gym. What’s the feeling of being famous & performing on stage? That’s one of my ambitions before, but I think its just a dream for me. I think I’m dreaming to big. But anyways, good luck & hope we can be friends. God bless Kuya Chuckie! Thanks for dropping by my site…! Yeah… times sure have changed… although I’ve been away from the limelight, I somehow never really left since everything I’m busy working on nowadays is still connected to television and movie production. Blogging is my favorite pastime. Yes, I love movies a whole lot… I even make time to watch a whole bunch of trailers… I love trailers as well! Music has always been a passion of mine even during my showbiz days… but only now have I truly concentrated more on this field… it’s very fulfilling! I know what you mean when you say you can’t leave the house without your iPod or walkman phone… probably like me, music dictates your life as well. Music is a very good outlet… it relieves stress… rejuvenates… among other things. Hello, thanks for dropping by my blog and viraltagging it. Nice to know you today. You’re new layout makes me wanna wear eyeglasses whenever I type comments! LOL! kidding aside, but it looks more clean though. Nice one! Nice blog. I’m glad I stumbled upon it. I’ll add you in my blogroll. So, you think I look nothing like my old self? Hehehe… well, I was chubby then… I lost a lot of pounds since… and well, yeah, maybe it’s also the hair! Haha! I checked out your blog as well. Cool… you love running, eh? Marathon and all that stuff… and your family’s into it too. Nice! We “kinda” have something in common I guess… I love bodybuilding, and cardio takes up a huge chunk of my time over at the gym. Low impact though… so running isn’t one of em. Brisk walking maybe and some bike time. i can’t believe i haven’t written anything on your guestbook! :p to think i’ve been checking your blog for some time now! hehehe! Haha -> homemade patata! If we send you some, baka may amag at makunat na yun by the time it gets there! Hahaha! Long time no hear! Ano balita? Parang missing in action ka for the longest time ah! Hahaha! What have you been busy with the past few months? btw, i linked you up on my blog… my friends might start wondering how i became friends with a celeb! sikat na ko! hehehe! Haha! Yeah… critic ang dating ah! Hehe! Hey, thanks for adding me to your blogroll! Will add you up as well! hi there! interesting blog you got here. 🙂 just dropping by. hi there. katuwa namang napadaan ako sa blog na ‘to hehe. 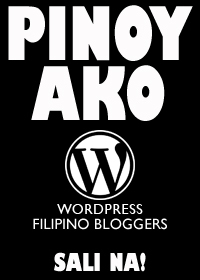 nice blog 😉 ba’t nga ba ngayon lang ako napadpad dito? hmmm. sige babalik-balikan natin to 😀 oks keep on blogging. see you around the blogosphere bro. wandered in from pinoyblogosphere. glad to have found you! just yesterday i stumbled upon anna bayle’s blog after peeking at designer rafe totengco’s. the world is truly smaller. galing! hello chuckie!i first stumbled upon your blog when i was looking for call center bloopers, i bookmarked your blog from then on.it was just then that i added u up on my blogroll (hope it’s ok! ), then i found out that you are “the” chuckie dreyfuss from tiyanak!i’ll be frequenting your blog,for sure! Howdy!! Nabasa ko na ata lahat nang message dito about you and comments but still have no idea or remember seeing you on TV. ah baka siguro hindi pa ko pinapanganak nun? Joke lang. Are they talking about That’s Entertainment? Tiyanak di ko pa napanood at Lola Basyang? Wow! grabe ala akong alam.Can you tell me more kung ano pang movies or tv show na nandun ka baka may ma alala na ako…. i grew up watching you during the 80’s when i was still in my preschool days. and it’s good to know you got a blog nowadays. i wrote to you because i found the candles version of upside down magnificent and it’s giving me a hard time in the web to found it in mp3 format. would you mind if it’s ok if i can have the copy of their song. i just wanna put it in my mp3 player. i basically hate the 6 cyclemind version. that’s why i’m asking you if it’s ok. thanks. have a nice day! Martha Louise, who is the only daughter of King Harald and Queen Sonja, gave up the title of ‘royal highness’ upon her 2002 marriage to writer Ari, and has a reputation for not standing on ceremony. Hi, Chuckster! I already left a comment on your About Me page, but here I am again. Wanted to sign here because I had a feeling I would become a regular visitor. If you don’t mind, I will write a post about you and your site on my site…just because I find it so cool that my childhood celebrity crush is now a blogger! 😀 And also because I have always felt a certain affinity with other bloggers. I’ll add you to my Blogroll, too, if that’s okay. Cheers! pa link naman http://angdamimongalam.wordpress.com thnks! PZNHH9 Thank you for the material. Do you mind if I posted it in her blog, of course, with reference to your site? ЗАмечательный сайт.Мало рекламы,уважаю таких администраторов. Дизайн ваш нравиться и ссылочки красиво горят. Подпишусь на ваш ресурс, Просто зашибись. Xrumer прогон, вот ссылка http://vk.com/progonov_net ! Там же кому нужно, могут исключить свой ресурс из списка по которрому ведется прогон и мои прогоны вас больше не потревожат ! Глубокоуважаемые владельцы мелкого, среднего и крупного бизнеса! В очередной раз подумайте о несомненных плюсах, которыевам способна гарантировать умелая ориентированная на интернет рекламная атака. Ежедневное размещение упоминаний о вашей фирме на различных форумах и досках объявлений, с отправкой на соответствующий сайт, создаст вам репутацию незаурядных, узнаваемых и востребованных мастеров своего дела. Я готов заняться этими весьма обременительными обязанностями. Используя программу XRumer, я я осуществлю прогон сведений о вашем сайте по форумам, доскам объявлений и популярным блогам. В итоге, ссылки на ваш веб-сайт с неизменно доброжелательными комментариями и узнаваемым фирменным знаком, с неизменным постоянством будут появляться на солидных веб-ресурсах. Hi, This is Martin -OMG! !